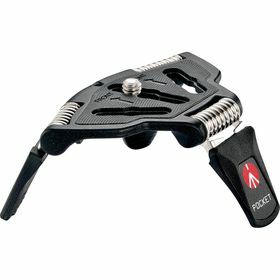 The black Large POCKET Tripod from Manfrotto is made for cameras up to 3.3 lb. With a maximum height of 1.6", this pocket tripod can be used for taking photos with a long exposure, or when using a self-timer. Its legs are independently adjustable, so you can level your camera on uneven surfaces. The 1/4"-20 mounting screw slides along the length of the tripod, so your camera can be balanced on the base. Weighing only 2.5 oz, the lightweight tripod is made with an all-metal construction for durability. Non-slip rubber feet help keep the tripod from sliding on smooth surfaces.